Two of the UK's top politicians - Prime Minister Gordon Brown and London Mayor Boris Johnson - now have access to electric cars, at least for a little while. 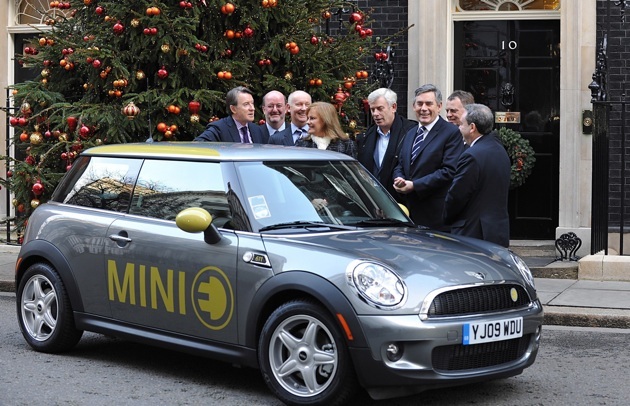 For the PM, a Mini E will be added to the Downing Street car pool for two months and will be made available to ministers for official business. Johnson's new electric car is an i-MiEV, which he is using in Denmark during COP 15, the United Nations Climate Change Conference 2009. While he's only using the car for a short while, he believes that EVs are the future. By 2015, every Londoner will be less than a mile away from an electric car charge point, he said, because there will be 22,500 recharge locations in the city then. It's not just politicians who are getting into the EV game. Over the weekend, 40 British drivers got their keys to Mini 3 units. Thus far, the UK has spent about £400 million to support the low carbon transport industry. Part of that money will go to Mini E drivers so their monthly rental fee for the cars is £330 instead of £550. UK Prime Minister, London Mayor get electric cars for a little while originally appeared on Autoblog Green on Tue, 15 Dec 2009 17:05:00 EST. Please see our terms for use of feeds. 0 comments on "UK Prime Minister, London Mayor get electric cars for a little while"